Raw papaya is peeled and chopped and pressure cooked till soft. It is then cooked with spices and milk. Serve papaya curry with milk with steamed rice and dollop of ghee. 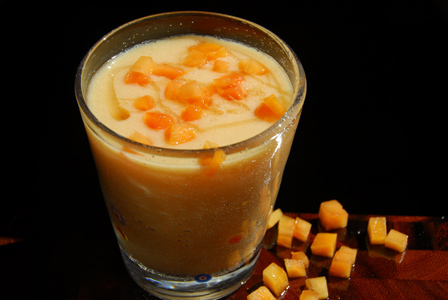 Makes: around 3 Servings of Papaya Curry with Milk. Heat oil in a pan on low flame, add all talimpu ingredients in order. When mustard seeds start spluttering, add chopped papaya, milk, turmeric powder, red chili powder and salt. Uncover, fry on medium high flame to evaporate any excess milk. 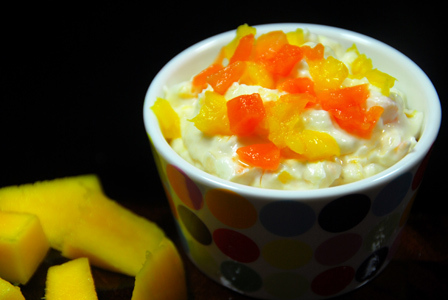 Serve papaya curry with milk with steamed rice and dollop of ghee. Notes: Make sure green papaya is cooked well. Other Names: Papaya Curry with Milk. Raw papaya and chayote are cleaned and julienned. They are then mixed with fresh lemon dressing and seasoned with salt and pepper. 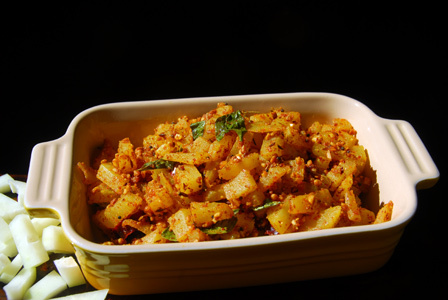 Serve papaya chayote salad immediately. Makes: around 2 Servings of Papaya Chayote Salad. Peel and wash the green papaya and chayote. 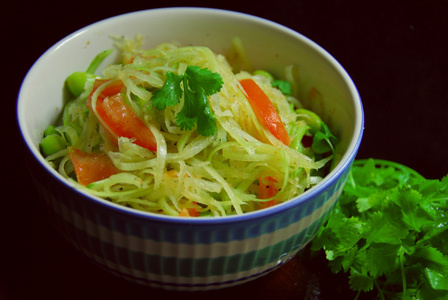 Use a julienne peeler to thinly shred the papaya and chayote (around 2 cups). Wash and finely slice the tomato. Remove stems and wash the green chiles. Wash and tear the cilantro leaves. In a mixing bowl, add lemon juice, green chile, black pepper powder, chaat masala and salt. Lightly crush everything and stir in julienned papaya, chayote, tomato slices, edamame, green chiles and cilantro. Set aside for couple of minutes for flavors to develop. 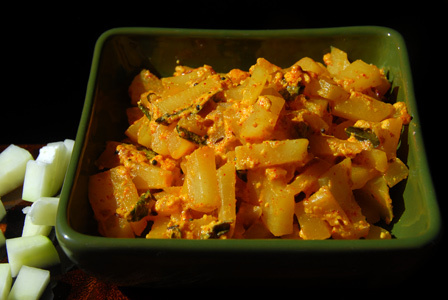 Serve papaya chayote salad immediately. Notes: Make sure to grate the papaya and chayote on thick side of grater if you don’t have a julienne peeler. Suggestions: Make sure not to leave the salad aside for long time once its seasoned especially if the vegetables are grated. Variations: You can also add thinly sliced red onion if you wish. Use boiled green peas in place of edamame (fresh young soy beans). Other Names: Papaya Chayote Salad.